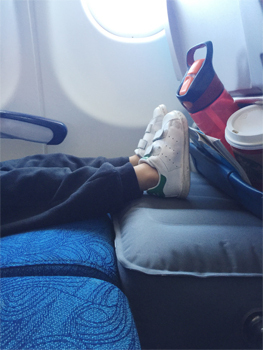 The Fly-Tot is an inflatable cushion that allows children to lie down flat on a regular, economy seat. This ensures that they sleep more comfortably and for longer periods of time whilst travelling by air. Fly Tot is the brainchild of two Californian Mums who realised that their kids did not sleep well or comfortably when travelling on a plane. Fly Tot is made of highly durable material that can fit into snug spaces. This means that it moulds to the space available and doesn't prevent the person sitting in front of the child from reclining their seat. Fly Tot can be inflated in less than 3 minutes and can be deflated in a few seconds. Australian Fly Tot distributor, Sarah Johnson states: "For the past four years I've been an expat living in the Middle East. With this comes a lot of travelling including several long haul flights back to Australia each year flying solo with two young children. Fly Tot has undoubtedly changed my travelling experiences for the better and the sleepless 14 hour flights are behind us! With my recent move back to Australia I decided to bring Fly Tot with me to help Australian families enjoy their travels"